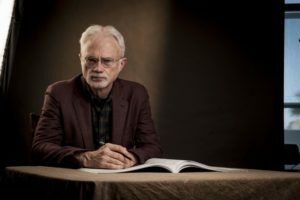 On Sunday, October 7, 2018, the Nashville Symphony gave a performance of Beethoven’s Violin Concerto in D Major, featuring international soloist James Ehnes, and John Adams’s orchestral masterpiece Harmonielehre. Beethoven composed his only (finished) violin concerto in 1806 for the Austrian violinist Franz Clement. Clement gave the work its premier performance at the Theater an der Wien on December 23, 1806. There is a story, the validity of which is uncertain, that Beethoven completed the score so late that Clement had to read the part for the first time in the premier performance. This may explain the initially poor reception of the piece, which continued to float by unnoticed and under-performed until the young Joseph Joachim brought the piece recognition, 17 years after Beethoven’s death, in 1844 with a performance under the baton of Felix Mendelssohn. While having its moments to the contrary, Beethoven’s Concerto is not a greatly technically demanding piece of music, though its requirements of musical awareness, sensitivity, and judgment from the soloist are close to unparalleled. James Ehnes’s years of experience really shone through in his performance on Sunday. His interpretation, while on the more conservative side, never lacked interest from the audience nor, evidently, the performers. From the first passage soloist played, Ehnes owned the hall. The concerto denies the audience the typical moment in the form where the soloist would enter playing the primary theme, instead giving an almost frustrating dance around arpeggiated dominants and scalar figures before finally giving the theme. 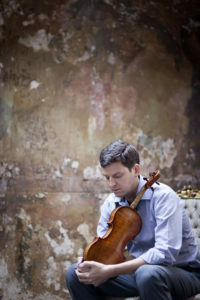 Ehnes took full advantage of this longing and set a precedent of gorgeous tone (thanks in part to the “Ex-Marsick” Stradivarius violin with which he performs), sensitivity, and wit. The second movement began with another excellent example of Ehnes’s awareness and sensitivity. The exchanges with the orchestra seemed without flaw. The second movement concluded with a cadenza that led straight into the excitement of the rondo, the highlight of which was the big cadenza of the third movement. Ehnes performed Fritz Kreisler’s cadenza with great clarity and virtuosity, generating excitement that drove through until the drop of Maestro Guerrero’s baton. The intermission was much needed after such an intellectually engaging performance. That said, I walked back into the hall filled with excitement about the piece to follow. Being a composer in the latter half of the twentieth century, one has to respond in some way to atonality and specifically Schoenberg’s ideals. John Adams responds quite directly, saying, “Despite my respect for and even intimidation by the persona of a Schoenberg I felt it only honest to acknowledge that I profoundly disliked the sound of twelve-tone music.” The title is, obviously, an ironic homage to, and response to, Schoenbergian ideals. Adams says that Harmonielehre is the product of a series of dreams of his. The first movement is based on a dream in which Adams saw an oil tanker on the waters of the San Francisco bay. In his dream, the ship takes off to the sky. The second movement, The Anfortas Wound, is based on C.G. Jung’s writing on the medieval character Anfortas. The third movement, Meister Eckhardt and Quackie, is based on a dream about his, then infant, child, Emily, who he had nicknamed Quackie. Adams dreamed of Quackie flying around with Meister Eckhardt, a German philosopher, and being told the secrets of happiness. The first movement begins with a strong statement of repeated e minor chords, 39 of them in fact, in a very minimalist gesture, the beginning of an “inverted-arch form.” The second movement is reminiscent of composers such as Sibelius and Mahler, with a particularly specific reference to Mahler’s tenth symphony. The third movement is in Eb major, a startling difference from the strong E minor center established in the first movement. Maestro Guerrero’s interpretation was tasteful to say the least. The big e minor chords can often be overdone by an orchestra, but the symphony’s range of the effects were never overbearing, but were engaging and drove the form into the audience. By the middle section of the arch, the audience was clawing for the neoromantic lyricism that followed, and then returned to the decidedly minimalist exterior with intensity, but sensitivity for the need of the listener. The second movement was stolen by the principal trumpet, Jeffrey Bailey. The dense surrounding areas of the solo were gorgeous, heart-wrenching chords that set a perfect background over which the trumpet could, and did, soar. The third movement radiated with the joyous hope one would expect from Eb major. With the mystic nature of the writing, the audience was transported straight into Adams’s dream of his daughter, floating ethereally through this soundscape hearing Adams’s prescription for happiness: minimalist techniques blended seamlessly with mid- to late-romantic ideals. The tension mounted about two thirds of the way through the movement, propelling the audience to the cacophonous ending of the piece, with the trumpets soaring over a very pointed background until the glorious, if not sudden, arrival of the Eb tonic. The Nashville Symphony was recording the Adams for a CD release through the publishing company “Naxos of America.” A CD that I excitedly await purchasing. The Nashville Symphony returns with a public concert at the Renaissance Center on October 20th, 2018.